All great civilisations of the past grew from earlier cultures. Yet the civilisation of Uru is unique, for none preceded it; instead we must seek its origins in the dawn mists of human beginnings on the Australian continent. Our search will not be among the Aborigines, but with far earlier Stone-Age races; ghostly shadows that beckon us back to another age, a past which few people of our present age have any knowledge of, but, for those who seek to learn of their origins, remains can still be found. That is the purpose of this chapter, for it is my intention to present an astounding array of fossil and other evidence to the reader which dares to challenge the traditional “Out of Africa” explanation for our modern human origins, which is the dogma of conservative anthropology. found by Mr W.F. [Bill] Gilroy in May 1972. Photo © Rex Gilroy 2005. Many anthropologists accept that more than one race of people reached here from Java. Their arrival was aided in remote times, it will be argued, by a vast land-shelf, containing what are now the islands of Southeast Asia, until rising sea-levels flooded this ‘bridge’ towards the close of the last Ice Age, forcing any future immigrants to reach Australia by water craft. Also flooded at this time, I argue, was an extension of this great land shelf, which linked Melanesia to New Zealand, but more anon. The Pleistocene period, which lasted from about 2 million to 10,000 years ago, supported a great number of animal and hominid forms now extinct worldwide. Much of the northern hemisphere experienced extensive glaciation, causing extremely harsh conditions, although the southern hemisphere was largely free of such inhospitable environmental problems, and our only glaciers were confined to the Victoria/NSW alps, and also Tasmania, which like New Guinea, was at that time joined to the Australian mainland. Beyond the southern alpine region the Australian landscape remained ice-free, enjoying a warm and temperate climate. The interior was a land of rich vegetation, forests and lakes fed by extensive river systems, an environment which supported a vast population of marsupial, bird and reptilian life, which in turn provided an endless food supply for our stone-age human, and near-human inhabitants. It has been called the Age of the Megafauna. 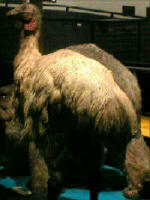 Giant kangaroo species of 3 metres in height shared the plains with more than one species of giant flightless bird. One of these, Dromornis stirtoni, reached 3 metres or more height, weighing more than 500 kg. 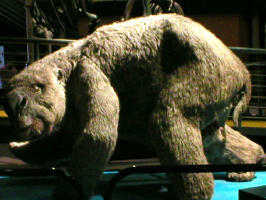 Roaming the grasslands was the largest ‘mega-marsupial’ of all, Diprotodon optatum, nearly 3 metres long and 2 metres tall at the shoulder. Crocodiles, today confined to the far northern Australian rivers, in those times enjoyed a distribution deep into South Australia; and the “ancient giant butcher”, Megalania prisca, a giant goanna of 7 metres length and about 700 kg weight, preyed upon animal and human life large and small. Then about 30,000 years ago, this Australian Ice-Age world began to disappear. The ‘megafauna’ and many other smaller creatures began to vanish. Scientists believe that at least two major causes were responsible for this devastating event; the environmental changes caused by the close of the last Ice-Age, and the hunting activities of the Aborigines. Yet as evidence demonstrates, there were earlier human inhabitants, which suggests the extinction was a gradual process working over a much longer period, accelerated only by the drying up of the continent.With the melting of the worldwide ice-sheets the sea-levels began to rise, gradually separating Australia from New Guinea, and Tasmania from the mainland; while the remaining land-bridges were flooded to form the present-day islands of southeast Asia and Melanesia; and the extension ‘bridge’ with New Zealand was also submerged, isolating New Zealand, creating the two main [North and South] islands with the flooding of the Cook Strait. 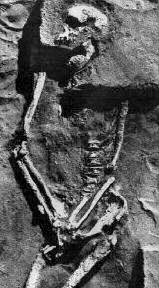 In 1967, at Kow Swamp in northern Victoria, archaeologists found ancient burial sites between 15,000 and 9,000 years old. The skeletons unearthed display anatomical features distinct from those of modern Aboriginals. These people were far more robust and heavily built in physical appearance, for their skulls were very thick, longer and larger than any modern Aboriginal types, with receding foreheads and thick eyebrow ridges, huge cheek bones, jaws and teeth. Soon after these finds, archaeologists made further important fossil human finds at Lake Mungo in southwestern NSW. The skeleton of a female unearthed there, and since carbon-dated to be 68,000 years old, displayed physical features reminiscent of modern humans displayed physical features reminiscent of modern humans. These discoveries demonstrate that two distinct races of people had occupied Australia at the same time, during the last Ice Age. The evidence thus implies that the robust [Kow Swamp] race are descendants of the Java Man [homo erectus] of 500,000 years ago, while the smaller Lake Mungo race entered Australia from China, probable descendants of the modern Aboriginal People. Scientists have long argued that, at the time modern Aboriginals were developing here, sea levels were much lower than they are today, but that Australia was cut-off from south-east Asia, making crossing by water craft necessary. 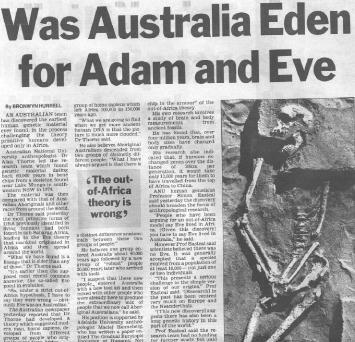 This conservative scientific view however, cannot explain how, for argument’s sake, a race of pre-Homo erectus people with no water craft construction skills could have reached Australia [as I shall demonstrate] from Java. The implications are that, at a period earlier than 50,000 years ago, Australia was connected to mainland Asia by a continuous land-bridge between Indonesia and New Guinea. I will also show that a continuation of this ‘bridge’ extended from New Guinea to New Zealand. I have never been able to accept the ‘traditional’ view that our first Stone-Age inhabitants were the Aborigines. Spurred on by this belief I began a search during the mid-1960s for evidence supporting my theory. After three years of fruitless searching, I eventually located an extinct [Ice-Age] course of the Macquarie River near Bathurst, in Central Western NSW. Projecting from the former bank of this river at one site, I discovered numbers of massive stone implements; hand-axes, clubs, adzes, knives and other tools, ranging in weights of from 5.5kg to 16.5kg. Such huge ‘megatools’ could only have been made and used by hominids of immense stature and strength. I afterwards learnt of Aboriginal traditions of a race of giant men and women, the ‘Jogungs’, who once roamed the Central West, and whom the Aborigines say, stood twice the height of a normal human. In the years since then I have recovered further ‘megatools’ elsewhere in NSW and Central Qld. The most recent finds include a monstrous ‘chopper’ made of basalt. Measuring 36.5cm tall by 37cm wide by 9cm thick, it weighs 20 kg, and was found near Nundle, southeast of Tamworth, in the New England district of Northern NSW. It is the largest and heaviest megatool I have so far discovered. The former tribespeople of this region believed in a race of giant man-like beings called ‘Wolumbin’, that roamed the earth in the long-ago ‘Dreamtime’. 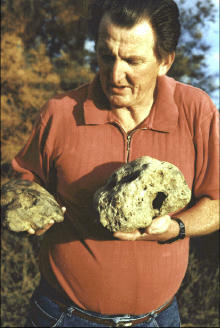 Newcastle NSW geologist, Dr Harold Webber, after examining the Bathurst megatools in the 1970’s dated them at not less than 50,000 years old. These tools bring to mind the massive fossilised jaws and teeth, dating back 500,000 years, excavated in Java and China, identified by anthropologists as the “Giant Java Man” [Meganthropus palaeojavanicus], whom they say, stood at least 3-4 metres in height, and would have been of immense strength, weighing around several hundred kilograms. Many scientists believe Meganthropus evolved as a genetically mutated offshoot of the smaller ‘Java Man’, Homo erectus, who gradually evolved into modern humans. I believe the “Bathurst Giants” were part of an Australian, independently-evolved genetically mutated giant form of an Homo erectus population; and if so, this process would imply that Homo erectus had been resident here for a considerable period of time; a proposition supported by the combined researches of leading geneticists and anthropologists worldwide, who suggest that a race can take up to 150,000 years to evolve. Parallel with the megatool finds at the Bathurst site, my father, the late Mr. WF [Bill] Gilroy, was fossicking at a creek further east in the Tarana district one day, when he retrieved a large fossil hominid skull from surface gravels, close to an alluvial bank at a point 6.6m from the water’s edge, and 2m above the water level. The skull is actually mineralised [limestone] and is distorted, the brain case being flattened at the back, and part of the jaw is fused to the palate. 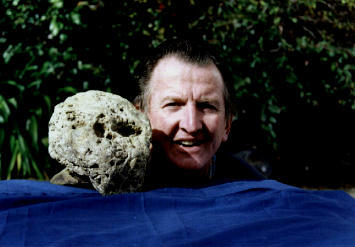 The 'archaic' Homo sapien skull found by Mr W.F. [Bill] Gilroy in May 1972. The right side of the skull has been pushed inwards, crushing the right brow ridge. This has been due to geological pressure on the skull during the mineralisation process. The fossil measures 25cm long across the dome; 19cm wide and 18cm in depth. Labelled “Tarana Skull No 1”, a comparative study of this skull type, allowing for its distorted appearance, permits a reconstruction. The general formation of the skull suggests a more modern rather than primitive hominid. For example, the skull lacks a receding forehead, and thick, projecting eyebrow ridges as would be expected in a Homo erectus skull. A reconstruction shows a Brachiocephalic [ie rounded] rather than a Doliocephalic [ie long, narrow] skull type as found in Homo erectus fossils. The appearance of this skull places it within the genus Homo, but not with erectus; rather it belongs to the ‘archaic’ line of Homo sapiens, now seen in a direct line between Homo erectus and later, ‘modern’ humans who lived in Asia between 100,000 and 300,000 years ago. A year after the first discovery a second mineralised hominid skull was recovered by me at the same site, but at a distance of 33.3m further along the same gravel bed on the creek’s edge. Measuring 16cm across the dome, by 14cm in width and approximately 9cm in depth, there is some braincase and jaw missing; and like Skull No 1, it has been crushed on its right side through geological pressure during the mineralisation process. Tarana Skull No 1 & No 2. The skull displays distinct differences to those of Skull No 1, and is the more primitive, or archaic of the two. This skull possesses Doliocephalic anatomical features, with a receding forehead and prominent eyebrow ridges, beneath which, as in Skull No 1, the eye sockets are clearly defined. A portion of lower jaw survives, fused to the palate. It matches Java examples of ‘late Homo erectus’. The Tarana Skulls had been exposed by floodwaters from the base of 3m deep Pleistocene sediments covering a former campsite, which Newcastle geologist, [late] Dr Harold Webber dated to around 100,000 years BP [Before Present]. 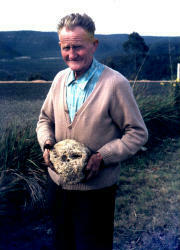 As the mineralisation process takes at least 250,000 years, it is evident that the skulls are of considerable antiquity. Dr Harold Webber suggested an age of around 250,000 years, but added they could be much older. The presence of both skull types at the same site suggested that, by at least 300,000 years ago, populations of both late Homo erectus and ‘archaic’ modern humans [Homo sapiens] were living side-by-side in the Bathurst district, if not elsewhere across Australia, Homo erectus gradually giving way to his offshoot, Homo sapiens. Yet ‘archaic’ modern humans could date back much further.